Hi-Tech device provides CRYSTAL CLEAR WATER for less than $1 per month in electricity cost without the use of chemicals! One unit treats ponds up to 25,000 gallons. Energy efficient (less than $1 a month in electricity costs). IonGen G2 Electronic Pond Clarifier comes complete with Electronic Control Panel, Low-Voltage Outdoor-Rated Transformer, 12 ft long Transformer Cable, 15 ft long Probe Cable, Flow Chamber with Replaceable Probe, Copper Test Kit (25 test strips), 2" PVC Slip Fittings, Universal Barbed Hosetail Fittings (1", 1.25", 1.5") and Owner's Manual. Replaceable IonGen G2 Probe typically lasts one to three seasons of use, depending on the ionization level of operation, size of pond, and water parameters of the water feature. 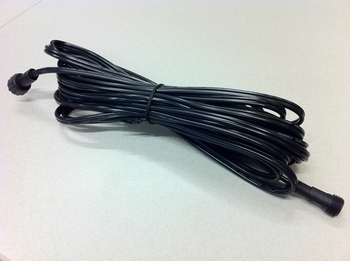 We also stock the replacement probe for the Original IonGen (G1). Special Rebate: If purchased between 3/15/14 to 5/31/14, Aquascape will send you a $30.00 PrePaid VISA card as a rebate. The Aquascape IonGen™ is a state-of-the-art electronic water clarifier solution for ponds, Pondless Waterfalls, and other decorative water features. The IonGen™ drastically reduces pond maintenance and provides crystal clear water without the use of chemicals. A microprocessor inside the IonGen™ control panel causes the outermost atoms of copper, silver and zinc to lose an electron, creating a positive ion. The positive ion attempts to flow from one of the Probe's bars to the other and is swept away by the flow of water where the ion can begin to treat the water. The IonGen™ Probe is self cleaning, using reverse polarity to prevent scale and debris build-up on the Probe's bars. The metal alloys in the Probe are scientifically blended and tested to produce maximum results. The IonGen™ System is safe for fish and plants and is not toxic to any animals that may drink from the pond. It's very important that you test the amount of copper that's available in a new pond or after a cleanout where there is very little bioactivity and/or algae to consume the copper, or copper levels can elevate quite quickly and cause a problem. If you simply test the amount of available copper you can easily prevent any possible problem with toxicity. Another thing that's very important is that you chelate the copper making it safer by the addition of Pond Detoxifier (see "Related Products" below). This will also help the available copper become chelated and work more efficiently on deterring algae. How does the IonGen work? The automatic control panel send signals that slowly dissolve the replaceable metal probe. This unique combination of metal ions increases water quality, clarity and drasticlly reduces time consuming maintenance. Easy to use touch pad makes it simple to adjust the amount of ionization. Can be easily adjusted based on size of your pond or water feature. Electronic indicator automaticly notifies you when the probe needs replacing. 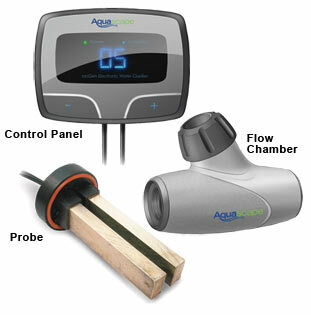 The probe typically last 1 - 3 seasons depending upon usage, quality of water and water parameters of the water feature. Is this system detrimental for use in ponds with biologic filtration? Wouldn't it be counter-productive to invertebrates of all kinds? Answer: The IonGen will work in conjunction with existing biological filtration; it is releasing such miniscule amounts that it will not harm fish or invertebrates. It is recognized by the algae as a nutrient and absorbed so quickly you will not even detect it in your water table. If I cannot install the IonGen in my tubing, where should the IonGen should be placed:? Answer: It is functional anywhere water is passing through it. The Skimmer box is probably easiest because it's most likely already close to an electrical supply but it can be used in the BioFalls or even laying in the stream. Regardless the probes should be left inside the provided "T" fitting in any of the installation scenarios to protect them. We have seen applications however where the probe when dropped into a Skimmer or Biofalls and not installed in-line is not receiving sufficient flow. The result is poor ion distribution and the probes begin to scale up because the ions are not being pushed away with the flow. This can cause the green light not to be solid and continually flashing or the power not being able to be raised all the way. In some cases, the IonGen did work at full powewr but as the probe's bars scaled up, the probe got suffocated. The probe can be removed from the Flow Chamber and scraped clean and placed back in the filter WITHOUT the Flow Chamber. Can I leave the IonGen in my pond all winter? Answer: If the pond is running then it can be used all winter in it. If they turn off the waterfall and just have a bubbler / heater then it's best to take it out as it won't really be doing anything! Do you absolutely need a GFI with an IonGen because it only draws 1 watt? I can only screw in my probe 2 revolutions and it does not appear that the Probe is all the way in. Is this a problem? My Green light has been flashing since Saturday afternoon when we plugged it in. It immediately went to full bars. Is this a problem? Answer: If the green light is flashing there is no need to be alarmed. It is still working fine. The newest units are self-calibrating. The Instruction Manual recommends PH/Alkalinity Test Strips 98953 but I cannot find them on your site. Answer: There was a misprint in the first Instruction Manual. That part number is actually the Spring Start-up Kit. The correct item# for the PH/Alkalinity Test Strips is 80005 and is in the same drop-down box as the IonGen above. Will the salt I put it my pond adversely affect the IonGen? Answer: It will not affect the IonGen. In fact, it will actually increase the conductivity of the unit. Many ponds will require the addition of non-iodized salt (1 lb per 200 gallons) just to get the conductivity to a level where the IonGen will work correctly. I have had my unit for 3 weeks now and I am not getting a copper reading on my test strips. Answer: It is most likely a new generation self-calibrating unit so it will raise and lower the amount of copper on its own. Not reading any copper in the water table is normal as the copper is being absorbed by the algae as quickly as it enters the pond/stream bed.It may take 6-8 wks to see results. There is a Red Dot on the top of the probe. What is that for? Answer: The red dot should be in line in the direction that the water is flowing for best results. Another way to describe it is that the water should be flowing like a football going through the uprights. Is it ok to use Aquascape's Pond Detoxifier productor other products that bind heavy metals like copper? Answer: Detox is designed to bind heavy metals. 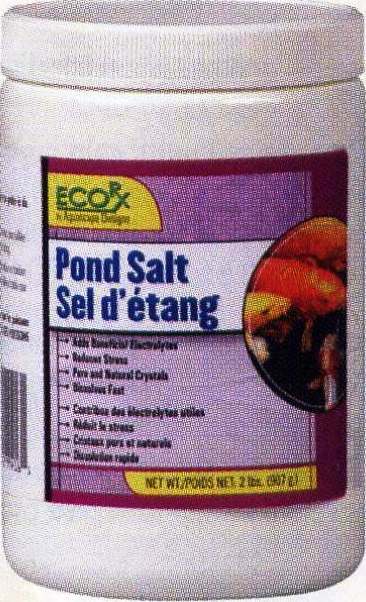 If you use Detox or add Detox every time you top-off your pond, the IonGen will; not be as effective. We are using well water. Will the IonGen work as well? I have heard the first IonGens did not automatically recalibrate. How do I know if I have an old or a new IonGen? Answer: Serial #'s 0005774 and BELOW are generation 1 units, 0005775 and above are new generation 2 units. Can the Control Panel be mounted outside in the elements? Is it waterproof? Answer: For G1 Units only , the control panel is NOT waterproof. It is weather proof though, it cannot be submerged in water or anything similar, it can be rained on though and still work. For G2 Units, the new control units are waterproof. Part of the new improvments over the G1 units. 8/4/2014 – Can a larger IonGen System, or 4-or-5 in tandem, be used to control algae in a non-recurculating pond on a golf course...??? . . .
9/5/2011 – We installed an iongen and all of our fish died. We bought new fish and they died. Third group are displaying signs of copper . . .
8/18/2010 – I have had my backyard pond for 5 yrs.I have gone thru 2 Savio uv clarifiers,and 4 replacement bulbs in that time.I am very . 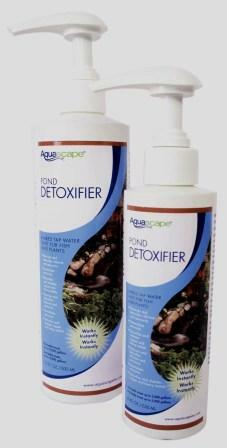 . .
Aquascape Pond Detoxifier Liquid for Water Garden & Pond Start-up Treatment – Helps to chelate the copper and prevent toxic build up in new or recently cleaned ponds.